Steiff Teddy Bears are renowned for their quality and traditional looks. Founded in 1880, Steiff began creating soft toy animals such as Elephants, before creating their first Steiff Teddy Bear in 1902. The Steiff motto is tribute to its wonderful toys: ” Only the best is good enough for children”. Steiff Bears are immediately recognisable by their ‘button in ear’ , which is a metal button with originally the symbol of an elephant, but now replaced with the name ‘Steiff’. 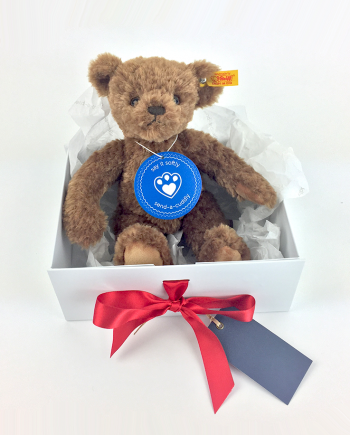 Send a Cuddly are official stockists and have a wonderful collection of Steiff Teddies in all shapes and sizes ranging from the original 1920’s replica Teddy, through to sweet animals such as Giselle Giraffe and Ming Panda.